New small business owners who need to build their credit-worthiness before applying for a high-end rewards card. 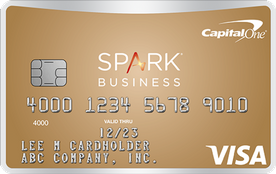 With no annual fee and 1% cash back on every purchase, this card is a simple way to start earning rewards while building your credit profile. See our favorite business credit cards. Our take: The Spark Classic card doesn’t offer the lowest APR or juiciest rewards; but it does help cardholders with damaged credit build a better credit score, and earn a modest amount of cash back, so they can qualify for more generous cards over time.